The Filipinos are children, utterly incapable of self-government. ... But, Senators, it would be better to abandon this combined garden and Gibraltar of the Pacific, and count our blood and treasure already spent a profitable loss, than to apply any academic arrangement of self-government to these children. They are not capable of self-government. How could they be? They are not of a self-governing race. They are Orientals, Malays, instructed by Spaniards in the latter's worst estate. PEOPLE INDOLENTâ€”NO COMPETITION WITH OUR LABOR. Example for decades will be necessary to instruct them in American ideas and methods of administration. Example, example; always exampleâ€”this alone will teach them. As a race, their general ability is not excellent. Educators, both men and women, to whom I have talked in Cebu and Luzon, were unanimous in the opinion that in all solid and useful education they are, as a people, dull and stupid. In showy things, like carving and painting or embroidery or music, they have apparent aptitude, but even this is superficial and never thorough. They have facility of speech, too. The three best educators on the island at different times made to me the same comparison, that the common people in their stupidity are like their caribou bulls. They are not even good agriculturists. Their waste of cane is inexcusable. Their destruction of hemp fiber is childish. They are incurably indolent. They have no continuity or thoroughness of industry. They will quit work without notice and amuse themselves until the money they have earned is spent. They are like children playing at men's work. OUR ADMINISTRATORS MUST BE EXAMPLES. TRUE INTERPRETATION OF DECLARATION OF INDEPENDENCE. The Declaration of Independence does not forbid us to do our part in the regeneration of the world. If it did, the Declaration would be wrong, just as the Articles of Confederation, drafted by the very same men who signed the Declaration, was found to be wrong. The Declaration has no application to the present situation. It was written by self-governing men for self-governing men. It was written by men who, for a century and a half, had been experimenting in self-government on this continent, and whose ancestors for hundreds of years before had been gradually developing toward that high and holy estate. The Declaration applies only to people capable of self-government. How dare any man prostitute this expression of the very elect of self-governing peoples to a race of Malay children of barbarism, schooled in Spanish methods and ideas? And you, who say the Declaration applies to all men, how dare you deny its application to the American Indian? And if you deny it to the Indian at home, how dare you grant it to the Malay abroad? PHRASE â€œCONSENT OF THE GOVERNEDâ€ MISUNDERSTOOD. The Declaration does not contemplate that all government must have the consent of the governed. It announces that man's â€œinalienable rights are life, liberty, and the pursuit of happiness; that to secure these rights governments are established among men deriving their just powers from the consent of the governed; that when any form of government becomes destructive of those rights, it is the right of the people to alter or abolish it.â€â€Life, liberty, and the pursuit of happinessâ€ are the important things; â€œconsent of the governedâ€ is one of the means to those ends. If â€œany form of government becomes destructive of those ends, it is the right of the people to alter or abolish it,â€ says the Declaration. â€œAny formsâ€ includes all forms. Thus the Declaration itself recognizes other forms of government than those resting on the consent of the governed. The word â€œconsentâ€ itself recognizes other forms, for â€œconsentâ€ means the understanding of the thing to which the â€œconsentâ€ is given; and there are people in the world who do not understand any form of government. And the sense in which â€œconsentâ€ is used in the Declaration is broader than mere understanding; for â€œconsentâ€ in the Declaration means participation in the government â€œconsentedâ€ to. And yet these people who are not capable of â€œconsentingâ€ to any form of government must be governed. And so the Declaration contemplates all forms of government which secure the fundamental rights of life, liberty, and the pursuit of happiness. Self-government, when that will best secure these ends, as in the case of people capable of self-government; other appropriate forms when people are not capable of self-government. And so the authors of the Declaration themselves governed the Indian without his consent; the inhabitants of Louisiana without their consent; and ever since the sons of the makers of the Declaration have been governing not by theory, but by practice, after the fashion of our governing race, now by one form, now by another, but always for the purpose of securing the great eternal ends of life, liberty, and the pursuit of happiness, not in the savage, but in the civilized meaning of those termsâ€”life according to orderly methods of civilized society; liberty regulated by law; pursuit of happiness limited by the pursuit of happiness by every other man. If this is not the meaning of the Declaration, our Government itself denies the Declaration every time it receives the representative of any but a republican form of government, such as that of the Sultan, the Czar, or other absolute autocrats, whose governments, according to the opposition's interpretation of the Declaration, are spurious governments, because the people governed have not â€œconsentedâ€ to them. CONSTITUTIONAL POWER TO GOVERN AS WE PLEASE. Senators in opposition are estopped from denying our constitutional power to govern the Philippines as circumstances may demand, for such power is admitted in the case of Florida, Louisiana, Alaska. How, then, is it denied in the Philippines? Is there a geographical interpretation to the Constitution? Do degrees of longitude fix constitutional limitations? Does a thousand miles of ocean diminish constitutional power more than a thousand miles of land? Re: The Filipinos are children, utterly incapable of self-government. As a race, their general ability is not excellent. Educators, both men and women, to whom I have talked in Cebu and Luzon, were unanimous in the opinion that in all solid and useful education they are, as a people, dull and stupid. In showy things, like carving and painting or embroidery or music, they have apparent aptitude, but even this is superficial and never thorough. They have facility of speech, too. Then as is now, purveyors of US imperialism and hegemony are so adept at "double speak" rhetoric to conceal their real purpose. But this fellow Beveridge was unable to couch his rationale in trying to convince the US Senate not to let go of the Philippines, as it is a convenient outpost for America to trade with China even then. Using vile aspersions, he calumnied the Filipino race just to promote his thesis.
. . . [J]ust beyond the Philippines are China's illimitable markets. . . We will not renounce our part in the mission of our race, trustee of God, of the civilization of the world. . . Where shall we turn for consumers of our surplus?. . . China is our natural customer. . . [England, Germany and Russia] have moved nearer to China by securing permanent bases on her borders. The Philippines gives us a base at the door of all the East. . . They [the Filipinos] are a barbarous race, modified by three centuries of contact with a decadent race [the Spanish]. . . It is barely possible that 1,000 men in all the archipelago are capable of self-government in the Anglo-Saxon sense. . . The Declaration [of Independence] applies only to people capable of self-government. How dare any man prostitute this expression of the very elect of self-government peoples to a race of Malay children of barbarism, schooled in Spanish methods and ideas? And you, who say the Declaration applies to all men, how dare you deny its application to the American Indian? And if you deny it to the Indian at home, how dare you grant it to the Malay abroad. Congressional Record, 56th Congress, 1st session, 704-711. Full speech available at http://www.mtholyoke.edu/acad/intrel/ajb72.htm. I desperately want to disagree with Beveridge but in spite of his racist comments and messianic vision of the U.S.A., the greater substance of his speech still rings true. i cannot disagree... most of the things the Senator had said are still true. unya masuko ra ba ta kon tinuod na. Thanks for showing that, Mike. Reading that really shames be being an American. It rings true the realities of the racist and Imperialist policies the United States engaged in during the turn of the 20th century. As was the old European ideas of social Darwinism. The Philippines is what it is today because of colonial rule; the Americans did not help by engaging a 4 year war that ultimately lead to the deaths of over 2 million Filipinos in the Philippine-American War. The Philippines already established its own republic, and its nationalist sentiment was high during the Malolos Republic, witht he messages of Rizal still ringing true to the hearts of the intelligentsia and soldiers of the Philippine Revolutionary Army. The American government with their greed, crushed that dream and enslaved the country for another 50 years. Thereby greatly contributing to colonial mentality. Patriots of the Republica Filipina de Malolos! The Brave and Young Gen. Del Pilar! Celebrating the birth of the Phil. Revolution. Americans seeking to justify the annexation of the Philippines turned to racial-exceptionalist claims against the "anti-imperialist's" national-exceptionalist ones. That is, supporters of colonialism argued that as "Anglo-Saxons" connected to the British Empire by blood, culture, and history, Americans were destined to acquire, and competent to rule, an overseas colonial empire. The power of this argument derived in part from the density of Anglo-American social, political, and intellectual contacts in the period; it was demonstrated in comparisons that Americans and Britons made between the Anglo-Boer War and the Philippine-American War. But the argument was countered by "anti-imperialists" who relied on the national exceptionalist claim that the United States' unique republican mission precluded overseas colonialism. Anglo-Saxon identity, they also argued, did not necessarily require the acquisitions of colonies. As a result of this debate, advocates of colonialism increasingly employed national-exceptionalist claims about the uniquely benevolent features of the American colonial government of the Philippines, although they also actively traded policy ideas with neighboring European colonial states. How do you define an empire? When does a state become one? Is the United States an empire? If so, when did it become one? In what way is the 1897 image of a fictional meeting between Queen Victoria and President McKinley a representation of empire? What else, besides tea, is Queen Victoria inviting McKinley to participate in? The goal here is to get students thinking critically about what they include and don't include under the rubrics "empire" and "imperialism." They might focus on territorial conquest or other impositions of power by one state on another, industrial or commercial exploitation of a state by another state or a private institution, or cultural dominance via religion, language, or mass media. What kind of contacts between Americans and Britons in the late nineteenth and early twentieth centuries contributed to the notion of a shared "Anglo-Saxon" heritage? What exceptional features were Anglo-Saxons said to possess? On what grounds might some Americans object to the notion of the United States as an Anglo-Saxon country? The aim is to have students think about the racial ideologies of the period as far more than irrational pseudo-science. They were serious arguments, which crystallized in specific settings and around specific political projects. How does the map represent the boundaries of the Anglo-Saxon world? Why would someone draw and publish such a map? Ask students to consider how the map darkens the territories of the British Empire, the continental United States, and its new overseas colonies, thus envisioning a single Anglo-Saxon region instead of separate national ones. What does the photograph of Mr. and Mrs. Turk's railway journey in Burma tell us about Anglo-American encounters in the colonial world? What does Joseph Earle Stevens' adoption of the white duck uniform and his membership in the Manila Club suggest about his self-image as an "Anglo-Saxon"? Why are the American Dave and the Englishman Will in the novel Between Boer and Briton able to befriend each other so quickly when they first meet? What do their family ties symbolize? What political purpose did Anglo-Saxon racial exceptionalism serve during the Spanish-Cuban-American War and Philippine-American War? Whom was the argument directed against? The goal here is to show students how American Anglo-Saxonism promoted solidarity between the United States and Britain in their imperial policies overseas. Consider the solidarity between the two empires represented by the 1898 Uncle Sam image based on the 1892 Cecil Rhodes image. Similarly, consider the juxtaposition of stereopticon sets of the Spanish-Cuban-American War, the Philippine-American War, and the Anglo-Boer War in the 1900 Sears catalog. Recall the opposing "anti-imperialist" argument that presented the United States as exceptional among nations for its republicanism, which precluded overseas colonialism. Then ask students: How did Anglo-Saxon racial exceptionalism and U.S. national exceptionalism overlap? How did they conflict? What does the 1899 cartoon "The White (?) Man's Burden" suggest about American reactions to seeing a supposedly "exceptional" nation--the United States--sharing the colonial "burdens" of the European powers? How did the legitimation of U.S. colonialism change after the declared end of the Philippine-American War? Now the goal is to have students understand that once American colonialists had a state of their own to point to, they no longer had to turn to Anglo-Saxon rationales or British precedents. Indeed, having a colonial state in the Philippines allowed them to recapture national-exceptionalist terms, arguing that American rule was not only unique but also better than European colonial rule. But how seriously did American colonial officials take national exceptionalism when they were making policy? What does U.S. colonial Agricultural Secretary A. W. Prautch's display of Philippine products at a fair in British Singapore suggest about bonds between the two colonial powers? Absolute and total ludicris. The philosophy of empire and subjugation of foreign peoples as a manifestation of a state's racial superiority is absolutely unconfounded. These words and philosophies were used by the conquorors as a means to legitimize their barbarity in forcing idealogues and policy on indigenous people; as well as to destroy their innate moral will. The destruction of the pride of the natives and installing arbitrary concepts such as racial superiority via social darwinism is nothing but imperialist horse feces (no pun intended). To undermine the moral will of the Philippines and foreign lands, to retard their natural resources for the benefit and consumption of the 'mother state', to spread their religion and have some sort of cultural imperial effects; thereby controlling the people via a long term basis. To secure their hold. That is the reason for such policies and arguments. The Spanish. Long have have the Spanish dominated the Philippines, and to this day, their imperialist policies are ever present in the Philippines. Roman Catholicism, of which I am part of and over 80% of the Philippine population (over 80 million) belong to it: yet it was a faith that was, and is argued to this day by academians, used to convert the indigenous population; to hispanify them so that the Spanish conquistadores could legitimately rule over the islands without fear of muslim uprisings. The faith was intially spread via the sword. Look at the historiography of the Spanish Empire in North and South America. The destruction of the classical, beautiful, technologically unique indigenous civilizations of the Aztec, the Inca, the Seminole, and the Carriba were manifested. Millions of inigenous Amerindians were liquidated by diseases such as small pox, syphilus, gonorea, the bubonic plague, cow pox etc. Many more died to starvation as the Spaniards subdivided the regions and peoples to work for their haciendas; millions more died in servitude to the Spaniards searching for raw natural resources such as: gold, copper, silver, hemp, tobacco etc. The Spaniards, yes, were the ones first to bring and initiate African slavery to the new world, to suffice the displaced population of dying amerindians. The africans were imported from the gold coast to work in the carribbean islands, in New Spain (current Mexico), Grand Columbia, and Real Peru (both of which were viceroyalties of Spain in south america) in sugar plantations, tobacco plantations etc. The spaniards initiated this slavery system, which would eventually be adopted by other european empires, most notabley the French, the English, the Dutch. The Philippines was not immune to this system, as many of the classical civilizations such as the Rajanate of Luzon, Rajanate of Maguindanao, and the Sulu Empire were reduced to vassals. The Spanish manifestation and use of 'fiestas', 'barangays', 'gobernillacidos' are mere samples of how Madrid controlled the people, taxed them, etc. To this day, over 100 years after the fall of the Spanish, their effects are present in the psyche of the Filipino. Even their names are still in use. The Americans were merely late to the scene of Imperiaism. And their usage of racial superiority, is null. The Spaniards used the very same concept; they believed in the racial inferiority of the indio; they believed that he was physically, mentally and spiritually enslaved to the Spanish. That view was cracked when the Spanish colonial wars errupted in the new world, where the 'inferior indios' of Mexico, Peru, Bolivia, Chile, Argentina, Venezuela errupted in open war for independence. One by one, those colonies defeated the 'superior caucasoid' Spanish. Thousands of Spaniards surrendered to the 'indios'; and the mighty Spanish Fleet was mangled in fighting 'rebelliosido' pirates. Even in the Philippines, when the Philippine Revolution errupted in 1897, and after the return of Aquinaldo from Hong Kong, the Philippine Revolutionary Army practically defeated the Spanish garrisons in the Philippine Islands. Liberated. All that was left of Spanish presence was Manila. And that itself wasn't taken because Aguinaldo honorably accepted Commodore Dewey's plea to Aguinaldo to spare Manila for the Americans. The 'indio' (the Filipino) was capable of defeating the Spanish conquistadore and by that right! By that right, the theory of white racial superiority was overturned. The only reasons why the Americans defeated the Philippines was not because of racial superiority. It was simply the fact that the Revolution had bled the Philippines during the war for Spanish independence. Thousands of man power had been exhausted, diseases were spreading; and yet, the Revolution trained 70,000 soldiers that defeated some 15,000 Spanish well trained soldiers. 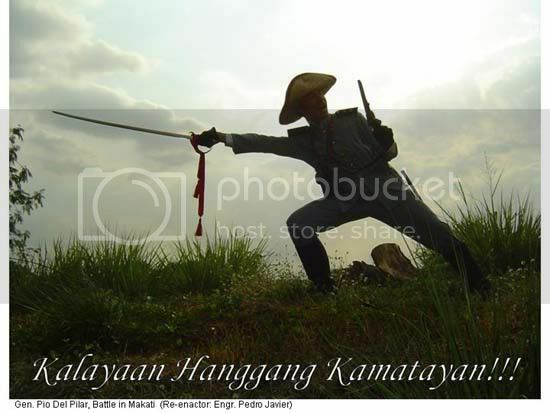 Let me tell you, that most of the Filipino soldiers weren't even trained; many of them didnt even have guns, but bolos and spears. Yet, were capable of deating Spanish artillery units, spanish armed infantry and cavalry. America won the war because it utilized racist policies against the Filipino. They used cut and burn policies. Where they would go into villages and burn them, kill the populace: a historical precedent of the Mai Lai incident in Vietnam. Americans considered Filipinos "Brown Niggers", and treated us as so. They brought in over 100,000 soldiers from the United States to 'suppress' the Philippines. With that, included rotating machine guns, howitzers, a large navy, and cavalry. The Filpino soldier was armed with only a bandera, a white uniform, spanish guns and bolos. We were able to bleed America with guirall warefare, and killed over 5,000 American soldiers (wounding over 20,000). The United States suffered more in the Philippine-American War than it did against its war with Spain. Had the Philippines been given the same advantages as the Americans, we would have reversed the outcome. I personally don't believe in racial superiority and racial bigotry. It is unfounded and without basis. Rizal is proof of that.